Many life coaches feel that they are good at coaching but not good at running a business. They’ve had a hard time understanding and implementing how to obtain the tools necessary to operate a business. 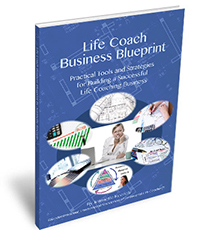 Life Coach Business Blueprint teaches you the business tools necessary for running your life coaching business more effectively and efficiently. This book gives life coaches a blueprint that will help build a business that is profitable and enjoyable to run. It covers everything from defining your market, to designing programs and teleseminars. You’ll learn how to create a practical plan for running and marketing your business by combining all the components in this book into a manageable time frame. This will serve as your business blueprint. Determine the destination of your life coaching business and map out a clear path with understandable milestones. And create a comprehensive blueprint to follow that will help you get into profit sooner rather than later. About the Author: Jeannette Koczela, a certified spiritual life coach and owner of Empowered Spirit Coaching, is the Founder & President of the International Association of Professional Life Coaches™. She combines her artistic talents and organizing abilities to promote life coaches and help them create successful businesses. This book gives life coaches a blueprint that will help build a business that is profitable and enjoyable to run. It covers everything from defining your market, to designing programs and teleseminars. It teaches you the business tools necessary for running your life coaching business more effectively and efficiently. We also have a 12-month business training program that guides you through all the material in the book. Learn by doing. Implement business strategies in a supportive coaching environment. Check out the Life Coach Business Blueprint Training Course here.